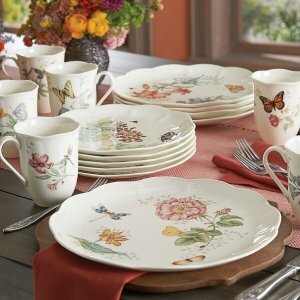 2018 Black Friday ！Macys.com offers the Lenox Butterfly Meadow 18-Piece Dinnerware Set + 2 Bonus Mugs for $89.99 . Features: This set includes 6 of each: 10.8'' dinner plates, 9'' accent plates and 12-oz mugs plus 2 bonus mugs. The whimsical charm of Lenox's Butterfly Meadow style is dappled with bright designs, in this scallop-edged set that serves six for dinner,with two extra mugs for tomorrow morning's coffee.